I consider myself a deep follower and lover of various sports but not American football. First of all that stuff they hold ain’t no ball. And to say the least, a football looks more like an egg. And they do more of holding the “ball” than kicking. What I am saying, in essence, is that the name of the sport should be called American Handegg. But there is this buzz that comes with watching the NFL (National Football League) finals that make fans or non-fans alike stay glued to their television. I personally think its because the hype comes from arguably the most powerful country (U.S.A) in the world. It is sometimes compared to watching the final of the UEFA Champions League or World Cup. The year 2018 was a special year in the NFL finals as the Philadelphia Eagles who were considered the underdogs going into the final against the New England Patriots on Sunday, February 4th shocked fans of the sport as they won the trophy for the first time in their history and the whole of America came to know of the secret behind their win. As the sound of their win reverberated across the U.S.A, many also came to know of their faith. Most of their team members were Christians and this was evident as after just winning the game. Stefen Wisniewski, one of the team members led the team in a prayer of thanksgiving. And this has been the custom of the team for most of their games. One of the team’s leading men in the faith and also a captain, Carson Wentz has said that it is his mission to “demonstrate the love of God by providing opportunities and support for the less fortunate and those in need.” The team has been known to hold Bible study and chapel services in their locker room and also perform a baptism on other teammates using the team’s swimming pool. Other members who have shown the world who they are in Christ are. 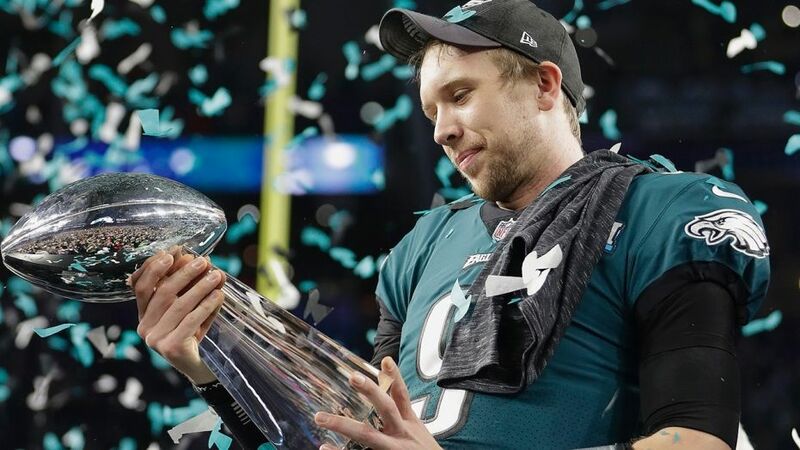 Nick Foles: who led the team because Carson Wentz was injured and was voted the final’s MVP. Nick Foles plans to become a Pastor after his football career. Marcus Johnson: Who got baptized in the team’s swimming pool. Stefen Wisniewski: led the team in a prayer of thanksgiving after their win. This is just to mention but a few and the effect of their showing who they are in Christ has not only had an effect on America but also on the World. On Sundays when they have games, and they cannot attend church, the Eagles hold chapel services within their training facility. A large group of players meet for bible study and also hold a study for couples and also get together for prayer and devotionals the night before games. The Philadelphia Eagles have shown the effect of corporate Christianity. That we are more effective as Christians when we come together to express our faith. When we do not forsake the gathering of the brethren, the influence of Jesus on the world will always be more than what we imagined. Encouraging each other in the faith. So to end this article here is a short documentary on some of the team members in the Philadelphia Eagles.